Julia Barzyk-Brommer from France graduated with a Wine and Management Diploma in 2017. She recently took over a vineyard in the Haute-Saône. She is in complete control of running the family business, from choosing the vines to the marketing strategy. Julia told us “the school gave me the keys which unlocked the doors to this new adventure”. Julia Barzyk-Brommer takes over the "Domaine de la Pâturie"
Which Estate did you take over and why? 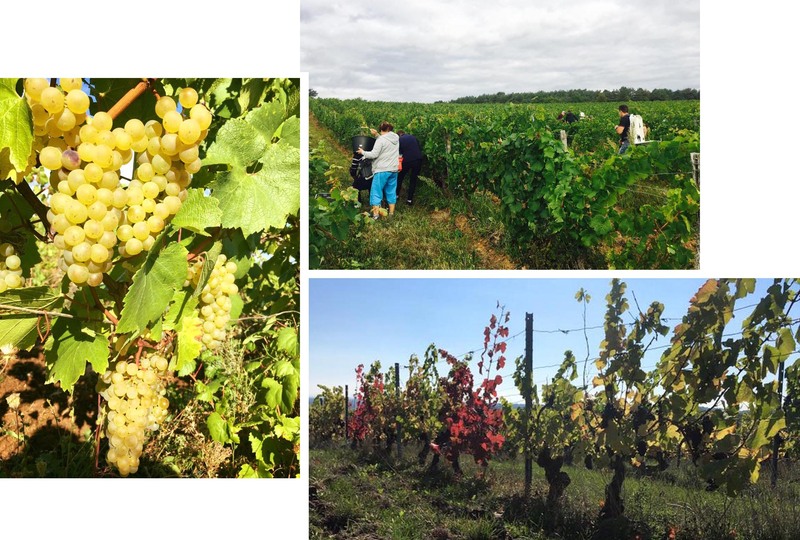 As a family, we took over the Domaine des Coteaux in Champlitte, a small village in the Haute-Saône department, bordering Champagne and Burgundy. My father-in-law, who grew up in the village, was profoundly affected by the dire situation in which the Estate had found itself and its financial worries. Fully aware of the content of the training programme I had followed, he asked me to be part of the adventure and put me in charge. In April 2017, we took the plunge, taking over the Estate and all its employees. It is a huge challenge: we are restructuring the vineyard, relocating to new premises and investing in new viticultural and winegrowing equipment. The key strength is the vineyard’s location: planted on one holding in the Pâturie locality, with a South-Easterly exposure, on sloping hillsides, with very rocky soil (calcareous-clay), and two main grape varieties which are extremely interesting to work with: Chardonnay and Pinot Noir. We have fallen in love with the location and its clear views stretching beyond the horizon, a slight altitude, and robust raw material, which just needs a little TLC. We are lucky, we can turn the page and write a whole new chapter. We have renamed the estate: Domaine de la Pâturie, a logical reference to its locality. The recovery has already begun: out of the 27 hectares of vines, planted with 4000 vinestocks per hectare, some plots will be planted to make up for missing vinestocks (this will involve planting several grape varieties on the same plot) and others will be removed to refocus on quality. What type of wine are you going to produce? We want to build a homogenous and realistic range for our first vintage. Above all, quality will take precedence over quantity. To achieve that, we are going to return to manual harvesting, there will be a second sorting at the winery, and the grapes will be transported using gravity (a pump will not be used for red grapes, to ensure they aren’t damaged). The aim of this range of wines is to encourage the fruit to express itself, to be of good quality and affordable. We aim to produce brilliant and precise wines which are a true expression of their grape variety. We will also produce a range of “selected plot” wines. We have carried out a pre-selection of plots (best grapes, exposure, soils etc.) which will unveil themselves after vinification (expression of the terroir). These plots (Pinot Noir, Chardonnay and Pinot Gris) will be vinified differently (concrete and wooden truncated vats for reds) and the wines will be aged in oak barrels (in part new) and in demi-muids (400L - 600L barrels). We are encouraging the terroir to express itself and, of course, more obvious complexity and structure from the wood. There will also be rosé wine made from blending Pinot Noir, Pinot Gris and Gamay. How did your training programme at Le Cordon Bleu Paris institute enable you to get rapidly up and running? One thing is sure, my oenology folder containing the lessons taught by Mr. Ramage last year, is on my bedside table again! I am extremely lucky to be fully immersed in the business now and realize that Le Cordon Bleu training programme is extremely comprehensive. From choosing the vines, buying materials, marketing strategy and, of course, my ability to manage the harvest and vinification period. The school gave me all the necessary tools to embark on this new adventure. I like being able to taste and analyse the old vintages we have inherited, in order to evolve and improve, and being able to manage the business thanks to the grounding I received in entrepreneurship and employee management. This school also opened the doors to the wine industry and its network, which today have enabled me to surround myself with qualified professionals with whom it is a real pleasure to work. The encounters during tastings, shows, and with speakers, were a real opportunity and I am now reaping the rewards. The strength of Le Cordon Bleu school truly lies in its ability to enable us to be fully operational the minute we start working, in a profession in which passion is more than ever a necessity! How did the first grape harvest go? When will your first wines be on sale? Our first harvest is going extremely well; we are lucky as there is a real sense of involvement from the local community and they therefore play an active role. We have 33 grape-pickers (pickers, grape porters, vat-house), all from this department and of varying ages. There is a micro-climate in the Pâturie locality, in Champlitte, which was very beneficial during summer. Harvest began on 2 September, with good ripening on certain plots of Pinot Gris and Chardonnay. Then the cold and rain arrived and ripening slowed. We have taken a day at a time ever since. The new moon brought about a change in the weather with the sun and warmer weather returning. We really want to push the ripening of our Pinot Noir to the limit, so we need to be patient! Our first bottles will be ready in March/April 2018.